All products are designed with quality and durability and are built to ISO-9002 standard. Our systems are modular and provide endless configurations to meet customer needs using standard stock items, modified parts and customized components. Pallet "Wrapz Roller" unwraps wrapz in 10 to 20 seconds. By Dehnco, Inc. This is the pallet wrap roller is available in 44, 74 and 84 inch lengths. It is used to roll up the Wrapz while on your skid. It is a quick and efficient method to allow your workers to unwrap your Pallet Wrapz. The Pallet Wrap Roller by Dehnco is used to unwrap the Pallet Wrapz in about 10 to 20 seconds. If you are unwrapping truck loads of Pallets all day long, 50 to 500 pallets, these are extremely efficient tools necessary to cut down time and tightly wrap your Pallet Wrapz. Please Contact Dehnco about Pallet and Packaging Production Solutions. This is the DEHNCO reusable stretch film system that is fast and easy to apply. pallets for stretch film wrapping. Your pallet is now wrapped and protected on location. You can moved it immediately to a truck. Typical Application:Economy Rotary Cutter is used to dispense and cut useable size sheets from rolls of material. They are typically useful in packaging and production areas to replace box cutters, scissors, hand tearing or other inefficient forms of converting roll material into sheets. Typical Application:RC-Rotary Shear cutters are used to dispense and cut useable size sheets from rolls of material. Typical Application:The Compression Cutting System positions the material between the sharp rotary cutting blade and a flat hardened metal cutting surface in the base. Sufficient down pressure is exerted against the blade to compress and cleanly cut through materials. "Dynamic tension" between the upper channel and the base assures uniform cutting compression across the entire cutting surface. Typical Application:Pneumatic Compression Cutting System position the material between the sharp rotary cutting blade and a flat hardened metal cutting surface in the base. Sufficient down pressure is automatically exerted against the blade to compress and cleanly cut through materials. Typical Application:The Dehnco floor roll stand is used to store rolls of material off the floor or table. Casters can make the stand portable so materials can be positioned wherever they are required. The adjustable uprights allow material to flow onto the table or make it easy for the worker to dispense sheets with bending or straining. The Dehnco Wall Roll Stand is used to store rolls of material on any vertical surface to keep it off the floor or table. The base and uprights supports bolt into any flat surface. The cantilever arms are available to hold roll diameters up to 24-inches. Rolls mount onto removable roll bar. The bar rests in sturdy notches in the arm. The system is a low cost way to put roll material within easy reach. The Dehnco Multiple Roll Stand is used to store rolls of material off the floor or table. Casters can make the stand portable so materials can be positioned wherever they are required. The adjustable uprights allow material to flow onto the table or make it easy for the worker to dispense sheets with bending or straining. 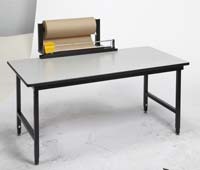 Dehnco Table Roll Storage Bar is used to store rolls of material off the floor or table top. 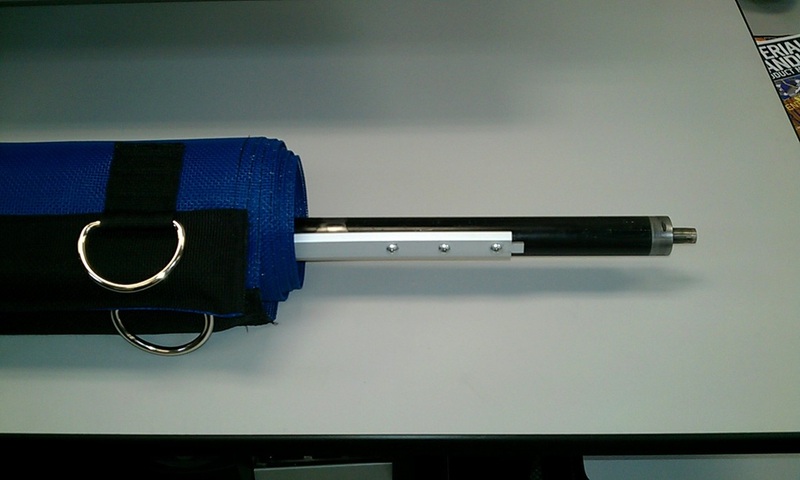 The roll bar kits can be attached to tables to allow roll storage where it is needed. On Dehnco Tables, material roll bars are adjustable along the uprights or leg assemblies to make it easy for the worker to dispense sheets without bending or straining. Dehnco Equipment & Supplies Co., Inc.